Colleen Coble is a new Christian fiction author for me. 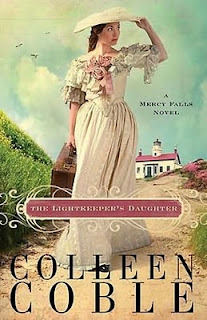 My feeling is that I've discovered a treasure chest of precious books.The LIGHTKEEPER'S DAUGHTER is full of excitement, suspense, inspiration and romance. It begins with the life of Addie who has grown up with the keepers of a Lighthouse in Mercy Falls, California. They find Addie after a shipwreck. Soon Addie becomes aware her whole life is a mystery. There are a few clues left behind to lead Addie Sullivan to the truth. These clues are like God's light in a dark tunnel. Unfortunately, I have never met Joyce Meyers in person. When she came to our home town one year my husband and son had the chance to go and hear her speak for three nights. I was at work. My husband excitedly told me over and over about her passion for God. He said she also had the ability to make the audience feel God's presence in the crowded room. I never doubted what my husband told me. I watched her speak on tv. She seemed to speak to me as a friend. I was sure she knew me through and through as she told about her flaws and the many strengths of her husband. Now for the first time I've enjoyed sitting quietly with one of her books, "hearing GOD each morning." I am almost tempted to list this book as one of my favorites of 2009. The book is jam packed with different issues and with solidly built characters. The story takes place in Whisper Hollow, Tennessee. What a surprise to read about Chattanooga. This is a place I know well. Jade is the main character along with her fiance Max. Each of these two characters have a past. I have always heard the old saying "let bygones be bygones." After reading "The Sweet By and By," I had to rethink this idea because no matter how much Jade or Max tried not to deal with the past it always appeared in their present moments.